Whether you’ll like this book depends on the reason that you pick it up. 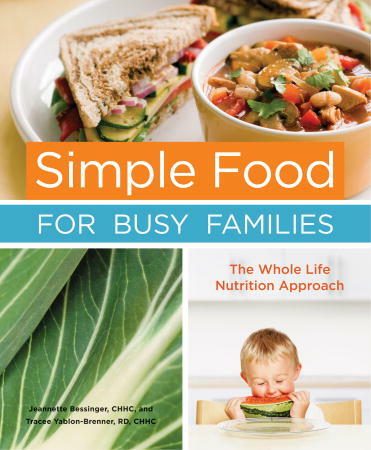 If your family consumes a lot of packaged food, or eats out frequently, and you’re looking for new approaches to eating that incorporate whole foods, you’ll probably find a lot to like in this book by holistic health counselors Jeannette Bessinger and Tracee Yablon-Brenner. If, however, you’re already eating a pretty good diet, or if you’re looking for a book to give to friends or family that will encourage a plant-based diet, you’ll be sorely disappointed. On the positive side, almost all of the authors’ nutritional advice is easily incorporated a vegetarian or vegan lifestyle, and most of their super-flexible mix and match recipes include plant-based choices — the two exceptions being their crustless quiche (made with eggs) and their stew (which only provides options as to what kind of meat to use). The authors also provide a critique of the Standard American Diet (“SAD”) and associated lifestyle that is likely to ring true with most veg readers. This book is geared to adults.